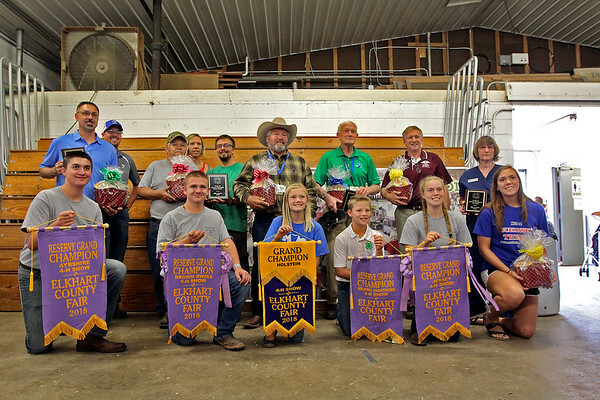 Winners of the Elkhart County 4-H Dairy Auction gather Friday following the auction. In front, from left, are Ryan Blosser, Goshen; Garrett Weldy, Wakarusa; Dulaney Paul, Goshen; Oliver Nisen, Leesburg; Rose Thomas, Middlebury; and Stepheni Gongwer, Elkhart. In back, from left, are Marc Blosser,of Goshen, father of Ryan; Brad Paulus, of ADM Nutrition; Don Weldy, of Wakarusa, grandfather of Garrett; Denise Rush, of Goshen, aunt of Garrett; Jeremy Rush, of Goshen, uncle of Garrett; Dr. Jerry Sellon, of Dr. Weldy's Associates Inc.; Dr. Robert Zell, of DVMS; Maury Kline, of Select Sires; and Judith Gongwer, mother of Stepheni.